Stick PCs have been around for a while, but they’ve really taken off in the past few years—with companies becoming increasingly able to pack more memory and storage inside of each device, and the ubiquity of HDMI ports on TVs and monitors, they’ve become much more versatile. And with more and more manufacturers getting in the game, you now have a lot of choices. Of course, there are still compromises to be made with stick PCs. They have enough power to run simple programs, and usually an office suite, but that’s about it. They’re great for streaming media, but they have a tendency to be a little slow and to have some difficulty with connectivity. For that reason, if you’re going to need to get work done while you’re on the go on a regular basis, you should consider a Chromebook before you buy a stick PC. That being said, this technology is improving all the time, and many people absolutely love the portability they get out of their stick PCs. As long as you don’t need them for heavy-duty computing, they’re certainly worth a look! There’s a reason why “compute stick” has come to mean any stick PC—this is the current industry standard. It’s available with Windows 8.1, Windows 10, and Ubuntu 14, meaning you can run most of the apps that you’re used to using, including the latest version of Microsoft Office 2016. The Windows version comes with 2 GB of memory, 32 GB of onboard storage, a quad-core processor, wifi and Bluetooth connectivity, a USB port, and a microSD card slot, so you’ll have all the power and storage you need to edit files, run presentations, and stream media. Built-in Intel HD graphics and audio broaden the possibilities for what you can use the stick for, and the included Intel Remote app lets you use your smartphone as a keyboard and mouse. 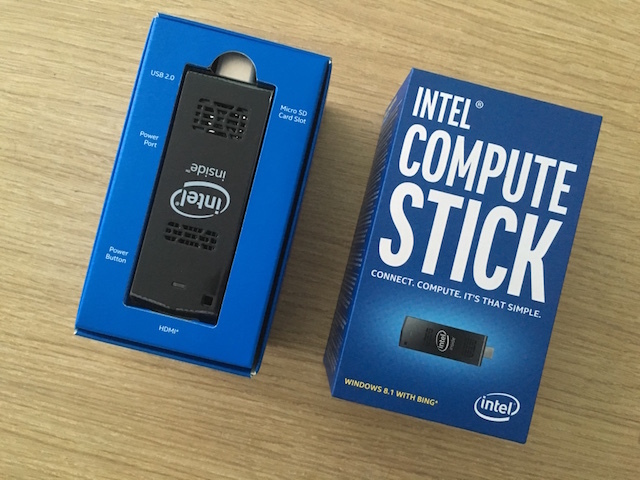 Unfortunately, the Compute Stick has a number of sticky problems: limited power throughput makes it tough to use power-hungry peripherals, Bluetooth is notoriously spotty due to the use of a single chip for both wifi and Bluetooth, and slow performance make this a good backup device at best. However, if you want a computer that fits in your pocket—and behaves like a pocket-sized computer—it’ll work. The Chromebit isn’t out yet, but it’s generated a lot of excitement already. 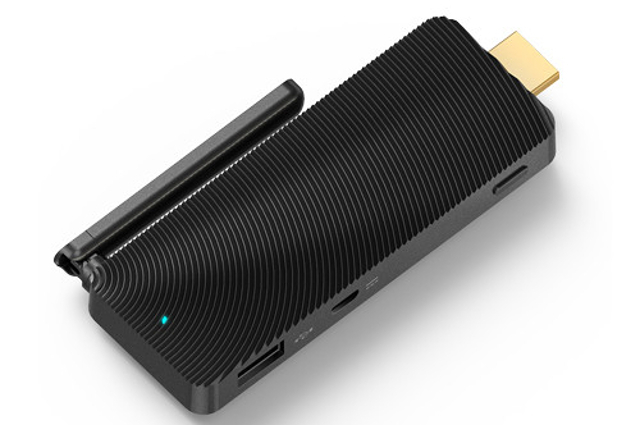 The Chrome family is already a large one, with the Chrome browser, Chromebooks, Chrome OS, and Chromecast—but it’s going to get bigger very soon with the addition of this stick PC. 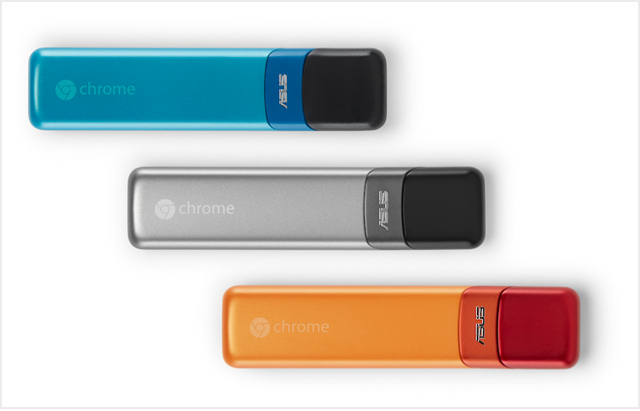 The Chromebit will turn any TV or monitor into the equivalent of a Chromebook running the heavily web-based Chrome OS. Because Asus hasn’t yet released the Chromebit, we don’t know the exact product specs, but it’s likely to pack 2 GB of memory, 16 GB of storage, a USB port, and, of course, both wifi and Bluetooth connectivity. The price and potential specs are fantastic—but whether or not the Chromebit is for you comes down largely to how you feel about Chrome OS. Many people who have tried Chromebooks won’t go back to Windows or Mac laptops, but if you’ve never used Google’s Drive apps before, you might be a bit concerned about how you’re going to get work done without Microsoft Office. Nonetheless, Chrome OS does provide just about everything you need out of a very small, highly portable computer, so the Chromebit will likely be a great choice for most people in the market for a stick PC. Asus is also catering to Windows users with its VivoStick, a forthcoming stick PC that comes standard with Windows 10. 2 GB of memory, 16 GB of onboard storage, 100 GB of free online storage for the first year, Bluetooth and wifi, three USB ports (one for power), Intel HD graphics, and an audio jack make this a well-rounded option for anyone looking for a stick PC. Interestingly, there’s no microSD card slot, making it look like Asus is trying hard to push people to its online storage system, which, presumably, is a solid moneymaker for the company. As with the Chromebit, we’ll have to wait a bit longer to get performance reports. However, for a stick with Windows 10 on it, this does seem like a good deal. 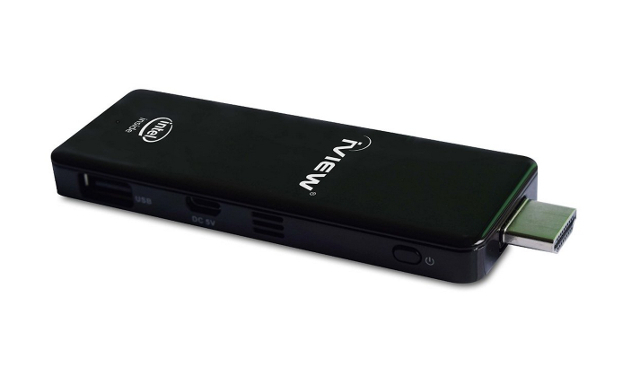 Pitched as a “Gamer Ultra Desktop,” the iView has very similar stats to other sticks; 2 GB memory, 32 GB storage, microSD card slot, quad-core processor, and both Windows 8 and Android OSes. The Cyber PC doesn’t stand out until you realize that you don’t just get the stick for the price: you also get a wireless keyboard to help you run it. Which is a big bonus if you don’t already have one. The ability to use both Windows 8 and Android out of the box could be a big advantage to users who are looking for a flexible stick PC, though iView’s promise of this being a gaming desktop is belied by the fact that the Cyber PC still only has 2 GB of memory, which isn’t enough to run more than the most basic games (at least without choosing a very low-quality graphics options). If you’re not gaming, though, and you don’t need Windows 10, the inclusion of a wireless keyboard could make this a great option. Most stick PCs are underpowered compared to full-size laptops. MagicStick aims to change that. With a quad-core processor, 12- or 16-core GPU, up to 8 GB memory, and up to 256 GB onboard storage, this stick PC could be a serious contender to replace a work laptop. It’s still in the funding phase, and deliveries won’t take place until December 2015, but everything that’s been announced so far looks very promising. The stick will come with a trial version of Windows 10 and Android, and also supports all variants of Linux. Although the projected retail price is $400, you can preorder the Wave model of the MagicStick through Indiegogo for $250 right now (plus $49 to unlock the full version of Windows 10), so if you’re in the market for a stick PC, you may want to take advantage. Of course, with no performance reviews, it’s tough to put down that much money. With 2 GB of memory, 32 GB of onboard storage, a USB port and mini-USB port, microSD card slot, and Windows 8, the Access doesn’t set itself apart with any of its specs. Its fanless design, however, does make it much quieter than its competitors, which is nice if you’re going to be using it when other people are around (a couple hours of a fan going full-blast is sure to drive anyone nuts). Another cool thing that you’ll get with this stick is a female-to-female HDMI adapter, letting you use an HDMI cord to plug in your Access even if there isn’t room behind the TV or monitor for the device. 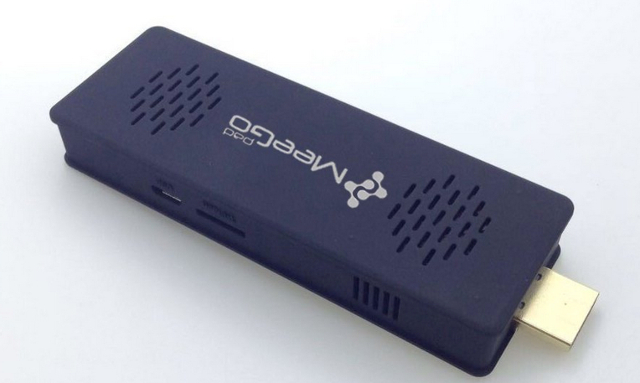 You’ll need to supply your own HDMI cord, but it’s still a pretty great convenience. Also entering the sub-$100 stick PC market, Archos will be releasing their own pocket-sized computer in the near future. 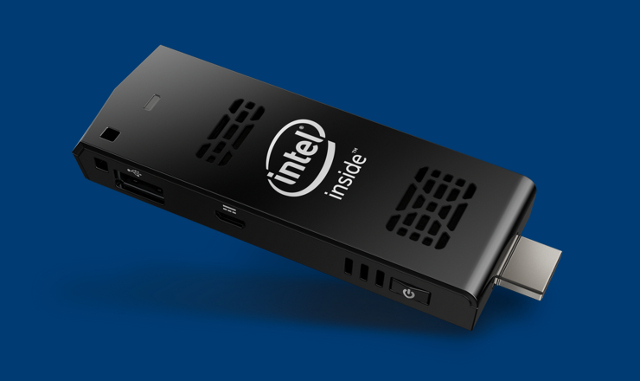 With 2 GB of memory, 32 GB of storage, a microSD card slot, and Windows 10, this stick PC should be able to compete with the best of them when it comes out. 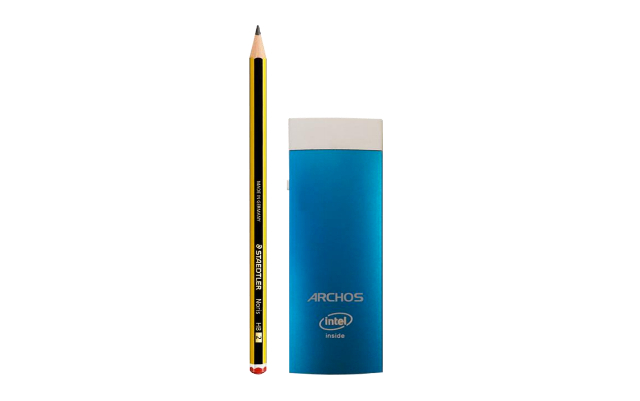 There will also be a smartphone app that will let you control the Archos, much like the Compute Stick. Although there’s no release date set yet, it’s fair to assume that Archos will start selling their stick PC by the end of the year or sometime in Q1 of 2016. When they do, it’ll be the cheapest Windows stick PC available, and promises to be one of the hottest competitors on the market. If you’re looking for a cheap stick PC that comes with Windows 10, the T03 from MeeGoPad should be on your list. It packs both Windows 10 home edition and Android, making it a very versatile option for the price, and its audio jack makes it great for streaming media. 2 GB / 32 GB is a standard size, but the T03 sets itself apart with smart cooling and a quieter fan than most (at least according to MeeGoPad). A single USB port doesn’t lend itself to much connectivity, but wifi and Bluetooth should have you covered anyway. MeeGoPad is a smaller competitor in this space, so it’s tough to say how this device will fare over the long run, but at least for now, it looks like it deserves a spot among the better cheap stick PCs, especially because it comes with Windows 10. The stick PC scene is growing rapidly, with new manufacturers and designs all the time. If you’re in the market for one, now is a great time to buy. If you can hold off for a few more months, though, you may be lucky enough to see the next generation of stick PCs and what they can do. They may very well blow away the competition. But even these first runs of tiny computers are getting relatively good reviews, so you can buy with confidence if you’re looking for maximum portability right away.